Why would you buy a Liebherr WTes5872 Vinidor? First of all, you should know that this is a very advanced wine cooler and not a wine fridge. Is there a difference between? Yes, the fridge does only what the letter says and that is pure cool. So you canset up your wine at a certain temperature. However do you have wines that you want to keep longer time, then it is important that in addition to the humidity, the smells in your wine Cabinet and vibrations are eliminated. It is also important that the wine cooler is placed on Vibration Reduction Blocks. This wine Cabinet is made out of high-quality stainless steel with UV resistant glass in the door. In this wine Cabinet you can 178 bottles of wine (bordeaux save format) which are divided into three separate compartments (called wine safes). In each compartment, you can set a different temperature. So you decide or a storage temperature in the compartment or serving temperature. The humidity has a direct effect on whether or not to dry out the Cork in your wine bottles. Cork is a natural product and has a certain air humidity. Is this too low, thenshrinks the Cork leaving bacteria can invade your wine bottle. The air humidity is too high, you will get mold on your labels and this fade. 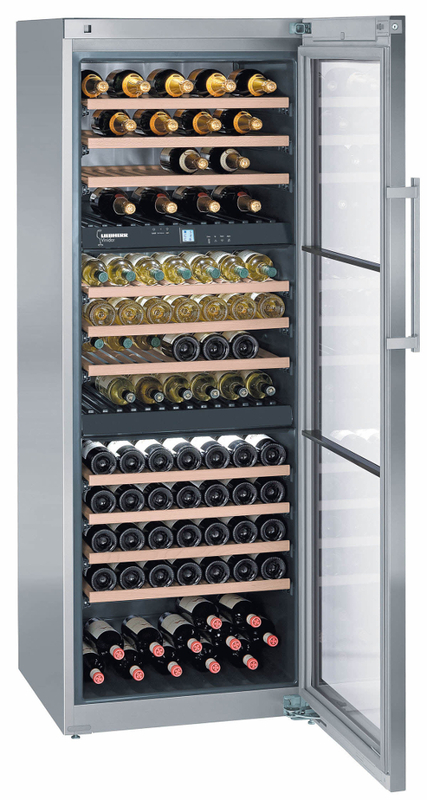 A good wine cooler allows you to change the humidity or provides for facilities. To measure the humidity it is important that you have a hygrometer. No analog, because this you must calibrate each time. You will need to purchase a digital hygrometer. The fragrances in your wine Cabinet should they be getting filtered. For this is an active carbon filter. This filter must be replaced every year to get it to work properly. This should do track you on your calendar, because otherwise you forget it. You want to leave your wines in peace, but you live in a modern world where you regularly do with ambient vibrations. The vibration of the compressor has Liebherr foryou have eliminated, but it is the ambient vibration of opening a door, the merger of a staircase to passing traffic, in your experience what this tiny, vibrations caused. It is these vibrations that the molecules in the wine can move, allowing the continuousof the wines more quickly than anticipated. You had the idea that your wine maturein 2019. Unfortunately, that was already in 2017, making this not fully balanced. If your wine is not at all at the desired height. The wines by they don’t actually mistreats on Vibration Reduction Blocks. These blocks are there on air as you fill the wine Cabinet more that this ‘ sinking ‘ in the wine Cabinet. This makes it possible to create aschokbrekendeffect. The omgevingtrillingen be taken care of. It is important that you realize that you are buying from a specialist wine cabinet with a sense of wine. So not in a white goods store where they happen to also sell wine coolers. The vendor must supply a digital hygrometer and you directly by explanation, because you are the one who is monitoring the humidity for your account is going to take. The same vendor should also provide for the Vibration Reduction Blocks,because los does a set quite some money. That vendor is also can be a door can turn around and can take care of the installation is a bonus. To timely to replace your Active carbon filter it is important that you do business with the right supplier who has decorated a Filter Alert Service. They keep on which filter you have and send you the appropriate filter annually. Perhaps now you think which Liebherr is able to do this? That’s a good question. InNetherlands, Belgium, Germany, France, England and the United States, there is only one company it all. This company is called Cavepromotor. Here you can also ask questions after you’ve purchased the wine Cabinet when it comes to storing and serving different types of wine.